The JSE also hosts training programmes that look at how companies can attract investors or speak to financial journalists, understand financial statements, etc. This iconic venue offers all the bells and whistles and Carol Crozier, manager: Company Services, says the spaces have been designed to encapsulate any brand – much like a blank canvas. We’ve got phenomenal catering on-site, of course, and the kitchen is able to put together a menu to accommodate the tightest of budgets if need be. 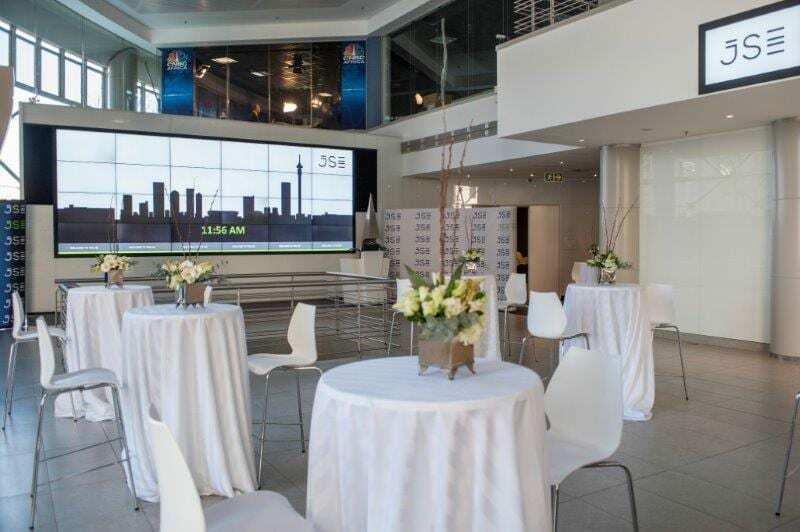 The media hub is available to non-listed companies as well, and we have Power FM and CNBC Africa studios on-site. Then we also have web streaming enabled by one of our partners, but all our venues are equipped with some of the most cutting-edge technology. We’ve got cameras, superb audio, high-tech lighting, hybrids – essentially all the bells and whistles that enable web streaming on-site. You will often find that our listed clients service their own clients across the world and will often host their event here while web streaming that to their stakeholders. That’s really where I think a lot of function spaces are going. And what’s been exciting about it all is that we’ve had this technology for four years now and we do it a lot – that’s our game! Some additional extras we offer are opportunities for clients to brand the room on our screens and we have on-site photography. Free-standing touchscreens or the wall boards can really bring clients’ events to life. We really provide a have a full turnkey offering. Do you have staff on-site to assist planners with the nitty-gritty details? Yes, absolutely! Our coordinators are phenomenal and we often get such great feedback about them. Our event coordinators are on top of everything; they do a lot of hand-holding and will spec your entire event for you. Also, our technical team is one of a kind: we receive marriage proposals for them all the time! They really ensure the smooth running of an event from a technical perspective and, because they are in-house JSE employees, they run with everything that takes place here. How do you elevate the JSE brand to attract people to your spaces? We opened up the JSE spaces to the public because we needed the brand to become more accessible. After 130 years, the brand represents tradition and stability. And to be listed on the JSE is a big deal – not only for companies but for us as well – and attracting investors into the country. That said, we have historically not been such a tangible brand, in the sense that listed companies don’t necessarily to mind the JSE itself. For us, it has really been about creating an awareness surrounding the JSE. By opening up the space to companies – where they can come, use it and leverage off our facilities – we hope to inculcate an understanding that the JSE is not just for listed companies and listings: it’s for you as an investor in this country.